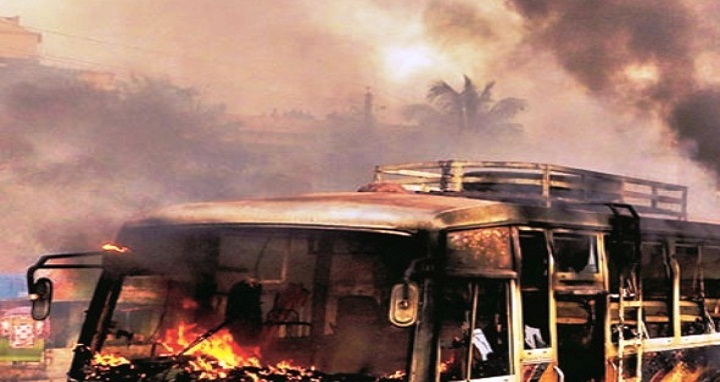 Dhaka, 10 October, Abnews: A fire bomb was hurled at a bus in Bogra hours after the verdict of August 21 grenade attack cases were delivered. The attack was reportedly carried out by BNP-Jamaat men leaving at least 3 people injured. Anjum Ara Begum, 50, Monira Begum, 40, and Shamima Akhter, 27 are the three passengers of the bus who suffered from injuries. They received minor injuries and were discharged after primary treatment in Mohammad Ali Hospital of the district. Police have reportedly arrested Nur Mahmud, assistant secretary of Bogra district Jubo Dal, following the attack. Earlier on Wednesday, former State Minister Lutfozzaman Babar, former Deputy Minister Abdus Salam Pintu and 17 others were sentenced to death while BNP leader Tarique Rahman and 18 others were awarded life term imprisonment for the August 21 grenade attack on Awami League rally in 2004.